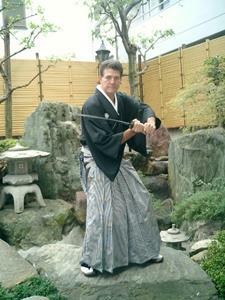 Welcome to GaryJWolff.com, which since Sept. 2009 has been the new homepage and cyber parking spot for Gary Joe Wolff, a Tokyo-based university professor, corporate communications consultant, model/actor, and all-round nice guy. This website started out as an attempt to start some sort of part-time online business, but I spent literally months searching for profitable keywords and trying in vain to figure out my niche. Not a clue. So instead, I decided to just renovate my original 22-year-old website, Gary Joe Wolff (in Japan), (which I have borrowed some content from as I've populated this site), but this time doing it right, in a way which provides greater value to the visitor and catches the attention of search engine spiders. 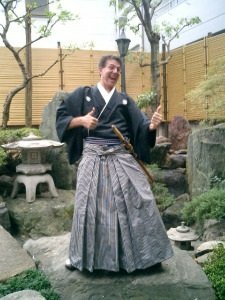 My intent is to continue in the same vein as before, sharing my uniquely American perspective of Japan's absolutely fascinating and exciting culture in a way that I hope others might find humorous or even insightful, including seasonal photographic and video updates of Japan's stunningly beautiful scenery. As a resident in Tokyo now for a remarkable quarter-century, I'm often asked by my stateside family and friends, "Gary, when are you moving back home?" Or "Why do you like Japan so much?" My answer to the latter is easy, and for several reasons. 2) The beautiful Japanese mountains (70% of the country). 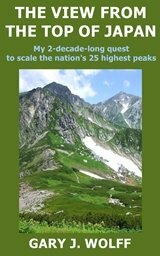 Over the past 27 years I've had the pleasure of scaling all of the nation's 29 highest peaks and in 2012 published a book entitled The View from the Top of Japan chronicling my many mountain climbing expeditions to Japan's spectacular alpine country. And after Mt. 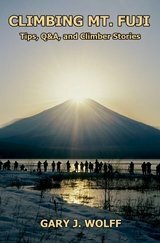 Fuji was named a World Heritage Site in 2013, I wrote my 2nd mountain climbing book, Climbing Mt. Fuji: Tips, Q&A, and Climber Stories. And I'd be remiss not to mention the absolutely stunning cherry blossoms and brilliant fall colors, neither of which we have much of in my home state of Texas. 3) A clean, safe, and efficient transport network 2nd to none (thus, no need to own a car). As a former professional traffic engineer, I never cease to be amazed and totally impressed with Tokyo's punctual train and subway system, safely transporting millions and millions of commuters across the metroplex every single day. 4) Excellent Japanese food. 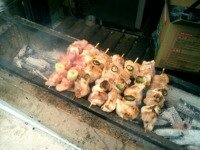 Ever heard of "negima yakitori" (grilled chicken & onion kebobs)? It's my favorite, and always reminds me of Dad's Texas BBQ, for which he was quite famous. 5) National health insurance. It doesn't come cheap, and Obamacare it is NOT, and the service is sometimes frustratingly slow and inadequate, but it is definitely nice to have, especially after you've crossed the half-century landmark. 6) Relatively speaking, a very safe and honest country (almost zero guns). I can't count the number of times I've lost/left briefcases, shopping bags, coats, a wallet (even w/ cash & credit cards), and even a newly purchased business suit on the trains, and they've ALL been turned in to lost-and-found offices. 7) Over 2000 onsen (hot springs), YAY! 8) Many people speak at least a little English (well, in the big cities, anyways). There's English TV, radio, movies, newspapers, signs, train station announcements, etc. All students study English 3 years in junior high and 3 years in high school (and most students well into their college years), and recently started studying it in elementary school as well. This wild man needs a WHOLE lot more practice!! 10) A convenient launching pad for visiting other exotic Pacific island travel destinations in Asia like Cebu, Philippines, Koh Samui, Thailand, Palau, Guam, Saipan, Langkawi, Malaysia, Phuket, Thailand, Fiji, Cook Islands, Boracay, Philippines, Ao Nang, Thailand, and Pattaya, Thailand. A few years ago, we did an exciting class project on what Japanese university students think about 16 various countries around the world. 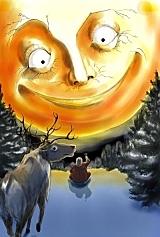 Please have a look-see at these very interesting stories when you get a chance. I think my students did a wonderful job! One final note. After the March 11, 2011 strongest ever Japan earthquake & tsunami and ensuing nuclear crisis, because I was home at the time and never lost my internet connection, in order to keep my overseas friends & family informed about the latest developments (they were all literally freaking out at the time, urging me to get the hell outta Dodge), I started blogging immediately. Over the course of the next 101 days after the triple disaster, I had posted 467 news updates. Anyways, I hope you enjoy the GaryJWolff.com website and I'd like to thank you for stopping by. If you'd care to leave a comment at the bottom of this page, it'd be great to hear from you. Please come back again soon as you find time to see what's new (my blog page) and to check up on how the site's coming along in the weeks and months ahead. Click thumbnails above to view full-size images. The navigation bar in the upper left column will help you find the major Tier 2 pages on this site, the bottom navigation bar will help you drill down for even more pages, and for an even more comprehensive listing, please see the Site Map. If all else fails, you can always search the site in the search bar at the top of every page. 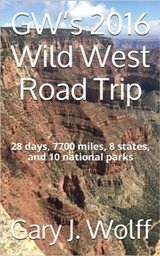 Have a question or comment about GaryJWolff.com? Do you have a question or comment about the GaryJWolff.com website? Please feel free to share it here! How much do acting/modeling jobs on average pay out (in Japan of course)?